If you want to be able to handle any Australian terrain with the lightest and strongest possible solution, but don’t have any intention of seeking out ice and snow, this is the complete package for you. Includes Short 4-pack, Medium 4-pack, Long 4-pack, Kit Box, Spike Wrench and Thread Locking Compound. For the Australian cyclocrosser who likes to be prepared for whatever the season throws at them, this is how you probably want to buy your spikes. If you’re into counting grams and want the strongest, lightest solution – Titanium is the way forward. It’s got all the Australian conditions covered with the three standard length spikes all organised in a secure but easy to use box along with a precision wrench and a tube of threadlocker to help protect your investment. There’s plenty of room to add to your collection. 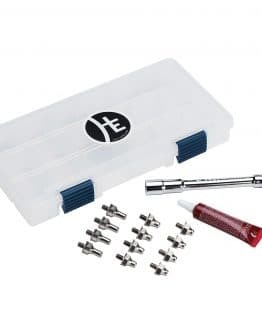 “The Pro Kit includes all three of our most popular cyclocross shoe spike sets plus the Kit Box, Spike Wrench, and Thread Locking Compound. The Pro Kit gives you the freedom to customize your shoes for conditions varying from dry and hard courses, to deep mud, sand, and wet courses.